Friday. I didn't feel much like contemplating the existential questions of website, identity and the like, so I wove. 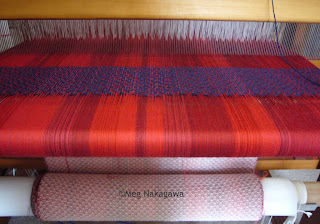 I still didn't like weaving the double weave blanket, but I had an idea about what I wanted to do with the leftover warp, do I soldiered on. With determination. And finished. No, officer, I have no recollection of throwing the shuttle when I finished the... challenging blanket. Then I jumped on to the leftover experiment. The weft is a wool of unknown origin; it's unattractively coarse and scratchy but has a lovely sheen and the hue is a beautiful indigo. Though I doubt it'll felt in the wet finish, I'm wondering if I can make it stand on its own. I have about a meter of warp left, so I hope I can weave about 60cm of it? 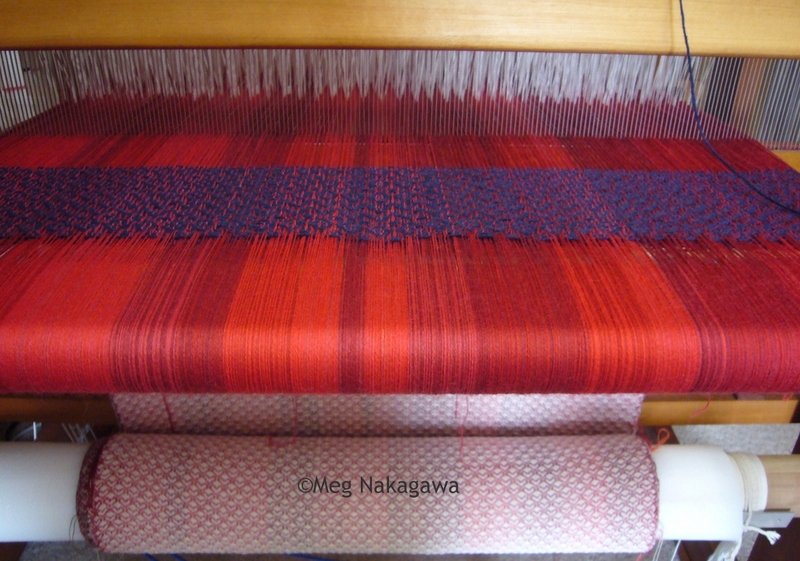 This is also the first tube, (except for 1cm in the sample in a doubleweave workshop in 2001,) I've ever woven. I've come to like knitting in winter evenings while sitting in the living room with Ben. So I dug up more wool to knit. I discovered some yarns I spun ages ago when I was learning to spin. It's coarse wool, even more badly spun, and as I didn't own a carder then, it's harsh and has no give; it's like knitting with those brown strings with which we used to wrap parcels. But the colors are saturated reds and blue-greens, and I figured I can make "project baskets" with them. We'll see how THAT goes. Saturday. It would have been a nice day to garden, as it was warmer outside, though at times gusty. Or finish the experiment. Or clean my closet or cull my past drawing under the bed. 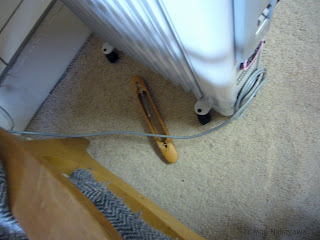 (The lot now stands higher than the space under the bed.) Instead, I made a care package for Mom, with a few hints about undulated twills. Her students are getting adventurous, and ventured into twill. Mom and I talked about warp-wise and weft-wise twill, but she didn't understand me when I said she can make shapes by weaving as drawn in. It's really not her kind of thing, she loves just twill, or herringbone, but who knows, one of her students might like it. Ben was looking forward to roast chicken for dinner, but the she wasn't thawed after 36 hours in the fridge. So, salmon tonight. Sunday, I would like for the both of us to clean out our closets. Our local Red Cross is totally out of winter clothes, and I have a few jackets, scarves, and couch blankets I don't use. And it's just down the road from us. In fact, I'll tell you a story about the location of their shop in a few days. And roast chicken tomorrow night for Ben.